I read this article and found it very interesting, thought it might be something for you. The article is called Overworked Tracks Make Indian Train Travel Unsafe and is located at https://archive.indiaspend.com/cover-story/overworked-tracks-make-indian-train-travel-unsafe-66568. On January 21, 2017, nine coaches and the engine of the 18448 Hirakhand (Jagdalpur-Bhubaneswar) Express derailed near Kuneru in Vizianagram district, Andhra Pradesh, killing 39 passengers and injuring 60, according to this report. On December 28, 2016, 15 coaches of the 12987 Sealdah-Ajmer Express derailed near Rura, 70 km from Kanpur, on the Kanpur-Tundla rail stretch. Two passengers died and 65 sustained injuries, according to this report. On November 20, 2016, 14 coaches of the 19321 Indore-Patna Express derailed near Pukhrayan, 60 km from Kanpur, in the Jhansi rail division. The mishap led to the death of 149 passengers, 182 were injured, according to this report. Each of these derailments over the last four months occurred on over-utilised sections of the Indian Railways. These stretches were used to run trains beyond their line capacity, according to the following map. Source: Indian Railways, Lifeline of the nation; Click here for the high-resolution image. As much as 40% of Indian Railways’ 1,219 line sections are utilised beyond 100%, according to Indian Railways, Lifeline of the Nation, a February 2015 white paper. Technically, a section using more than 90% of its capacity is considered saturated. The congestion rate is even higher: It is 65% on 247 high density line sections of the Indian Railways network. “The optimal utilisation should be about 80%,” said Mukut Mithi, member of the Standing Committee on Railways and a Rajya Sabha member. Track failures and subsequent derailments are caused by twin factors–excessive traffic and underinvestment in rail infrastructure–an IndiaSpend analysis of available data shows. Consider this: There has been a 56% increase in the daily tally of passenger trains over 15 years–from 8,520 in 2000-01 to 13,313 in 2015-16. The number of freight trains increased by 59% in the same period. 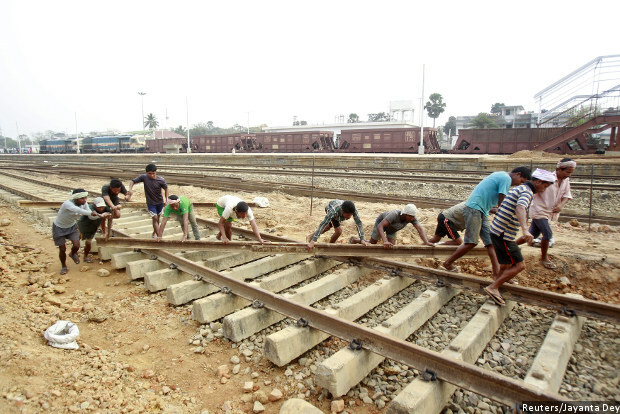 But the running track length for all these trains increased by only 12% in 15 years–from 81,865 km to 92,081 km. If you consider the period from 1950 to 2016, the underinvestment in rail infrastructure appears all the more acute. Against 23% railways’ route kilometre expansion, passenger and freight traffic increased 1,344% and 1,642% respectively, the Standing Committee on Railways concluded in a December 2016 report on Safety and Security in Railways. “Fatigue of railway tracks”, not explosives, is also the reason given by Gopal Gupta, director general, railways, Uttar Pradesh Police, to explain the derailment of 14 coaches of the Indore-Patna Express near Kanpur. This had contradicted Prime Minister Narendra Modi’s sabotage claim. Most of India’s high-traffic rail routes lie in the Gangetic plains, according to ‘Some insights on the recent spate of accidents in Indian Railways’, a 2012 Physica A journal paper on traffic flow along India’s express train routes. Of the 11 major accidents due to derailment or collision in 2010, eight occurred in this region, according to the paper. The Delhi-Tundla-Kanpur segment has been identified as India’s most risk-prone express train trunk route. Of the three recent mishaps cited above, one occurred on this segment. Rail traffic, especially in the Gangetic plains, is so excessive that “if all trains were to travel in accordance with their [Indian Railways] schedule, then the present infrastructure would not be able to handle the resultant traffic-flow”, the paper added. Indian Railways authorities manage this situation “by making trains wait at signals”, explained the paper. This practice results in “frequent delays” and also “increases the possibility of collisions in the event of human errors such as failure of the driver to react to signals”. The congestion on India’s tracks grows every year with the announcement of new trains and no parallel promise of track expansion. Every new train—“typically announced during the rail budget in response to demands of the people”, said Mithi—accentuates congestion on the Indian Railways network. Finance minister Arun Jaitley this year, for instance, announced new dedicated trains to pilgrimage and tourist centres. Stop such practice of introduction of new trains without commensurate inputs to the infrastructure, reads the February 2012 report of the Ministry of Railways-appointed High Level Safety Review Committee, a committee appointed under the chairmanship of Anil Kakodkar to review the safety of the Indian Railways and recommend improvements. But no one heeds this counsel. The result is that over the last 15 years, passenger kilometres, a representation of both the number of passengers and the distance they travelled, increased by 150%. And net tonne kilometres, a measure of freight hauled and the distance it has been transported, doubled. Congestion reduces the headway—the time-interval between two consecutive trains running on the same route—thus increasing the chances of collisions on very busy stretches. This also eats into the time available for maintenance. “We found a correlation between the low headway during the busiest time of the day and collision accidents,” said Niloy Ganguly, co-author of the Physica A paper and professor, department of computer science & engineering, at the Indian Institute of Technology, Kharagpur. Take the example of the overbusy Delhi-Kanpur segment. Between midnight and 7 am, the busiest rail traffic hours, railway staff got just 13 minutes to check the tracks, according to the Physica A paper. The rest of the day, the headway would increase to an average of 19 minutes. It is not as though there has been no technology upgrade in the field of maintenance. Indian Railways plies track-recording cars and uses portable oscillation monitoring systems to detect defects in track geometry, which includes parameters such as track gauge, alignment, elevation, curvature and surface, said Anil Kumar Saxena, additional director general, public relations, Railway Board. To test rails and welds, Indian Railways uses the ultrasonic flaw detection testing method. Since 2016, it has been testing the ultrasonic broken rail detection system used by the South African Railway on tracks maintained by Northern Railway and North Central Railway. To reduce weld failures compromising safety–the most likely reason for the May 4, 2014, Diva-Sawantwadi train derailment near Nidi village, Maharashtra, on the Konkan Railways, that killed 22 and injured over 150–Indian Railways has adopted improved welding methods. It has also been switching over to long rail panels on 83% of the track to minimise the need for welding. Maintenance typically happens by re-jigging schedules. “To work around time shortages, we would close lines to traffic when goods trains were scheduled to pass,” recalled Sainath Naidu, former commissioner of railway safety, Bengaluru, and former chief engineer (co-ordination), South Western Railway, Indian Railways. New tracks are vital for reducing traffic bottlenecks. 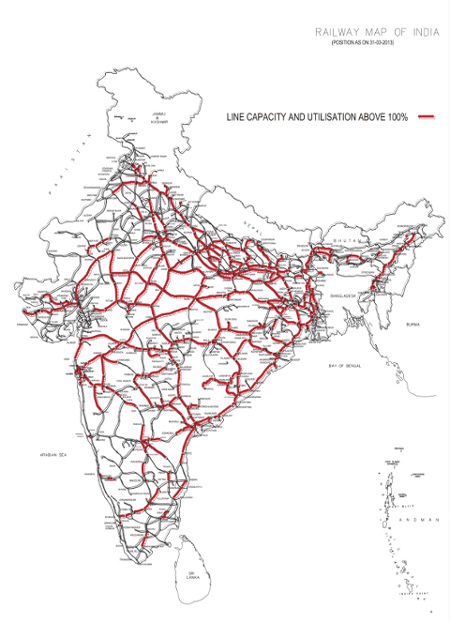 Two key projects launched in 2005 are the 1504 km-long western dedicated freight corridor (DFC) and the 1318 km-long eastern DFC, roughly corresponding to the overworked Mumbai-Delhi and Howrah-Delhi lines where the utilisation varies between 115% and 150%. When commissioned, the new freight corridors will absorb 70% of the existing freight traffic on those routes, thus significantly freeing up line capacity. They will also boost the speed of freight trains from 25 kmph–where it has stood over the last three decades–to 70 kmph. But it is unlikely that the corridors will be finished by 2019 as targeted, and here is why: The Dedicated Freight Corridor Corporation of India, the special-purpose body created to implement the projects, is expecting to fully award the civil and system contracts for the Eastern DFC only by June this year and all but one stretch awarded by the former United Progressive Alliance government are less than 50% complete, according to this update. There is also a lag in addressing “defects in the track or rolling stock”, a cause of derailment–the most common type of rail accident–according to the Standing Committee’s December 2016 report. In July 2014, around the time Prime Minister Narendra Modi took office, 5,300 km of track length was due for renewal, according to Indian Railways, Lifeline of the nation, a February 2015 white paper. Additionally, 4,500 km of track length comes up for renewal every year. But track renewal targets for the last three years have been roughly half of what is needed–2,200 km, 2,500 km and 2,668 km in 2014, 2015 and 2016 respectively. The first two were achieved. This shortfall will result in “disproportionately high maintenance effort”, to quote the 2015 white paper, and possibly curtailed speeds. Old coaches made by the Integral Coach Factory, the country’s oldest coach-maker, also impose speed restrictions–a top speed of roughly 100 km per hour (kmph). Coaches from Alstom-Linke Hofmann Busch (LHB) of Germany, on the other hand, are designed for speeds upwards of 130 kmph with anti-climbing features to curtail fatalities in the eventuality of an accident. So far, LHB coaches have been inducted only in premier services such as the Rajdhani, Shatabdi and Duronto. A policy decision to use only LHB coaches from 2018-19 will ensure other trains get them too. But the full replacement of the entire existing fleet will take longer, possibly up to 2040, this November 2016 India Today report suggested. Level crossing accidents–the second most common type of mishaps, as Mithi noted–will continue to pose a risk till they are fully phased out, at least on the broad gauge, according to a 2016-17 railways budget decision. This year, 15% of the 9,340 level crossings have been targeted for elimination. In this year’s budget, following three disastrous rail accidents, safety attracted a hefty allocation. It went towards the creation of a Rashtriya Rail Sanraksha Kosh (national rail safety fund) with a five-year corpus of Rs 100,000 crore. The government has conceded that investments in safety have been insufficient, but it has also claimed that India’s accidents per million train kilometres, a safety index, compares favourably with Europe’s. In India, this index has more or less declined over the last decade, reducing from 0.23 in 2006-07 to 0.10 in 2015-16. This figure is lower than that of France or Germany (both 0.17). However, this does not mean that Indian Railways is as safe as European railway networks because their trains run at speeds upwards of 250 km per hour, said experts. “Accidents per million train kilometres depends on the number of trains, which is huge in India vis-à-vis developed nations. It also depends on speed, another measure of infrastructure usage, prevailing law and order conditions, and temperature variation,” said Sukesh Kumar Sharma, a Hyderabad-based project management expert formerly with the Indian Railways. “A direct comparison between the railway systems of India and developed nations is not possible. Our average speed is of 60-70 km per hour–only few Indian trains reach a top speed of 130 kmph that is less than half the 300-kmph top speed of trains in developed nations. India’s low index paints a misleadingly rosy picture,” Sharma added.